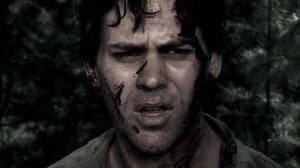 Axed is a short Australian made zombie film that doesn't even attempt to be nothing more than bleak, brutal and an exhausting experience in its 30 minute run time. Bruce (surely a homage to the Evil Dead's Bruce Campbell?) is enjoying a family meal when the house is invaded by gas mask wearing soldiers who march him and his family out into the middle of the woods to execute them, saying they are infected. Before Bruce is killed the soldiers are ambushed by a group of screaming, growling figures, so he makes his escape. Chased by the howling ghouls and having to avoid the brutal militia Bruce seeks a way to escape the chaos he has become swept up in. Plot is near non existent though this is in no way a bad thing, for the most part (excluding the first scene) you are with Bruce as he not only has to cope with the fact that everyone he loves are dead (his family, fiancee, best friend) but also that crazed '28 Days Later' style rage zombies are chasing him down. His descent into madness is completely understandable, often he starts laughing out loud, a man whose mind is cracking. The zombies look great for the most part, the camera work is so frenetic that there is not much time to look at the m but they come across as a real unstoppable threat swarming with numbers. The soldiers on the other hand all with their bio-suits and gas masks bring a real coldness and clinical look, you can't feel anything for this faceless monsters. Traditional living dead zombies also appear, these are not so well done, their faces just looking a bit strange with the effects on them. A bloody, grim, action packed half hour treat that I recommend to any fans of zombie horror! 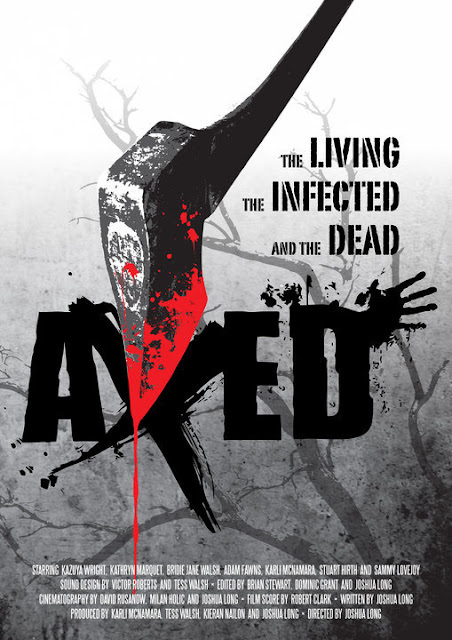 The creators of Axed are hoping to make a feature film of this, I wish them luck with that. Check out Axed below.